Breeding registered pure Spanish horses, and the Australian Stock Horse. Standing Andalusian stallion, Brujo MF. History, pedigrees, and photographs. Specializing in traing and classical dressage with Andalusian, Lusitano and Lipizzan horse. Listing stock for sale and offering dressage lessons. Located in Montreux-Jeune, France. English, German, and French translation. Promoting the Andalusian horse in North America. News, clinics, breeders book, member services, and rescue details. Includes photos and history of the breed. Andalusian breeder standing bay stallion at stud. Includes sales list, photos, and profiles of horses. Andalusian horse breeder. Bay stallion standing at stud. Horses of all ages available for sale. 7 Wild Wind Andalusians Andalusian breeder. Andalusian breeder. Provides pictures of mares and fillies, stories from shows, pedigree details, and individual horse achievements. Horse trainer and breeder standing two Andalusian stallions. Includes breed profile, events calendar, and stable history. A rare and exclusive breed, the Spanish-Norman blends the genes of the Andalusian of Spain and the Percheron of France to re-create the phenotype of the courageous horse that thundered across the battlefields of Europe. Site offers breed profile, foundation sires, breed registration and a photo gallery. Open to owners of Andalusian and Lusitano stallions. 12 Double R Ranch Horse ranch. Horse ranch. Andalusian breeder standing Principe RR. Details of pedigree and performance. Index of the sites connected through this ring. Andalusian horse breeder. Breeder of purebreds out of National Champion mares. Referral sales list. Andalusian horse breeder. Stallion photos, pedigrees and video clips, sales lists, mare galleries, and show results. Andalusian horse stud. Services, fees, photos of breeding stock, breed history, and stock for sale. Standing gray stallion at stud. Includes sales list, photos, and profiles of horses. Contains information on the Andalusian horse. Located in Forest Lake, Minnesota. Andalusian breeder offers PRE stallions at stud: Dobladillo II, Decorado, Disparo, Desdichado. Photos and pedigrees of breeding stock and stock for sale. Standing Andalusian, Westphalian, Trakehner, and Quarter Horse stallions. Includes photos and profiles of horses. Offers boarding, training, and lessons. Located in Quesnel, British Columbia. North American Registry for Azteca and Andalusian horses. Club providing seminars, training clinics, IALHA qualifying shows, breed information for Andalusian, Lusitano, Azteca, Spanish Norman, Hispano-Arab, and Iberian owners and enthusiasts. Southwest area, United States. Sourcing Andalusian and Lusitano horses from breeders and trainers in Spain and internationally. Includes services, sales list, and breed history, also Spanish saddlery online store. Based in the United Kingdom. Breeds horses including Saddlebred, Peruvian Paso, Paso Fino, Icelandic Horse, Andalusian and Paso Creole. News, horses and gear for sale, services and breed information. Contains articles and advice on horse care, health, training, and riding, a list of colleges and universities offering horse-related degree programs, a horsemans bookstore, and horse quizzes. Breeder of purebred Andalusian horses. Standing grullo tobiano, sorrel overo, bay quarter horse, gray quarter horse, and palomino quarter horse at stud. Includes sales list, photos, and profiles of horses. Located in Macon. Andalusian youngstock for sale. Located in Springdale, Arizona. Natural Horse People offer a unique online learning centre focused on the natural horse and supported by natural horse experts. Andalusian and Azteca horses for sale, as well as owners biography and location information. Barrel horse training and sales in Hesperia, CA. If the business hours of Miraval Andalusians in may vary on holidays like Valentine’s Day, Washington’s Birthday, St. Patrick’s Day, Easter, Easter eve and Mother’s day. We display standard opening hours and price ranges in our profile site. We recommend to check out miravalandalusians.com/ for further information. 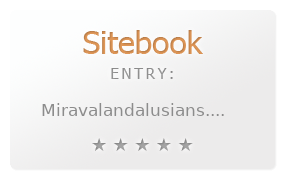 You can also search for Alternatives for miravalandalusians.com/ on our Review Site Sitebook.org All trademarks are the property of their respective owners. If we should delete this entry, please send us a short E-Mail.